Offering you a complete choice of products which include vibratory paper jogger and vibratory paper jogger for printing industry. 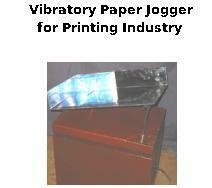 We manufacture Vibratory Jogger for stacking of papers, cards, forms, currency, envelope, cheques etc. These machines are manufactured in standard as well as custom built to client's requirement. The bunch of papers are placed on an inclined tray and they are vibrated to get stacked over the right angled edges. The stacked bunch may be tied or sent for further processing like printing, gluing, cutting, binding, stamping etc. We hold expertise in manufacturing and supplying a wide array of Vibratory Paper Jogger for Printing Industry. In this the bunch of papers are placed on an inclined tray and they are vibrated to get stacked over the right angled edges. The stacked bunch may be tied or sent for further processing like printing, gluing, cutting, binding, stamping etc. 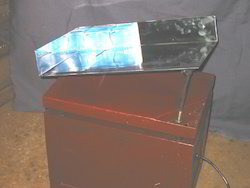 Controller provided to control the intensity of vibration. Looking for Vibratory Jogger ?